Power. Performance. Versatility. The Pressure Joe SPX3000 electric pressure washer delivers it all to tackle a variety of cleaning tasks: homes, buildings, RV’s, cars, trucks, boats, decks, driveways, patios, lawn equipment and more. Packed with an 1800-Watt/14.5-amp motor, the Pressure Joe SPX 3000 generates up to 2030 PSI of water pressure and 1.76 GPM of water flow for maximum cleaning power. Remove tar and grease from concrete, heavy mildew stains, oil stains, rust from steel, caked mud on equipment, and other stubborn gunk and grime. Equipped with a dual detergent tank system the Pressure Joe SPX3000 carries and stores two different types of detergent simultaneously in its two .9L onboard removable detergent tanks. Conveniently switch between different detergents with its detergent selection dial and blast away all sorts of grime. Its 34-inch extension spray wand and rear wheels provide easy maneuverability and access to hard-to-reach areas such as 2 story buildings and the undersides of the automotive vehicles and lawn equipment. Tailor the pressure output of the spray to your cleaning needs with Pressure Joe’s five quick spray nozzles. 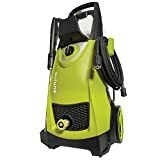 Other features include: 20 foot high pressure hose, 35 foot power cord, garden hose adaptor, and a TSS (Total Stop System) trigger that automatically shuts off the pump when the trigger is not engaged. Voltage 120 V ~ 60 Hz.